SMART BLEND SYNTHETICS One Advanced Formula Full Synthetic Multi-Vehicle ATF is specially designed and uniquely formulated representing the latest in full synthetic automatic transmission fluid technology. This Full Synthetic Automatic Transmission Fluid is suitable for use (SFU) in over 150 OEM designated lubricant part numbers for North American, European and Asian vehicles equipped with automatic transmissions. 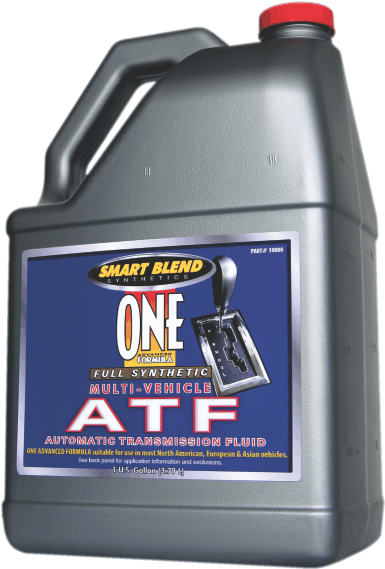 Smart Blend One Advanced Formula Full Synthetic Multi-Vehicle ATF is not intended or recommended for use in Allison TES, Ford Type F, Continuously Variable Transmissions (CVT), Dual Clutch Transmissions (DCT), MAN or Voith applications.